I’m often shocked at how much time some marketers spend trawling through the Google Analytics interface to pull stats together for reporting purposes. By manually extracting data from Google Analytics on a regular basis, you’re using up valuable time that would surely be much better spent on non-menial tasks. 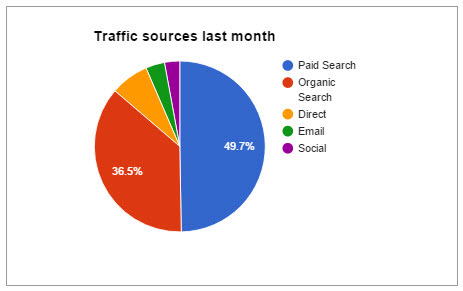 As a digital agency, we have recently delivered huge time savings by automating our client reporting via the Google Analytics add-on for Google sheets, which has allowed us to set up highly customisable analytics dashboards for each of our clients, providing them with a concise overview of their performance at all times. 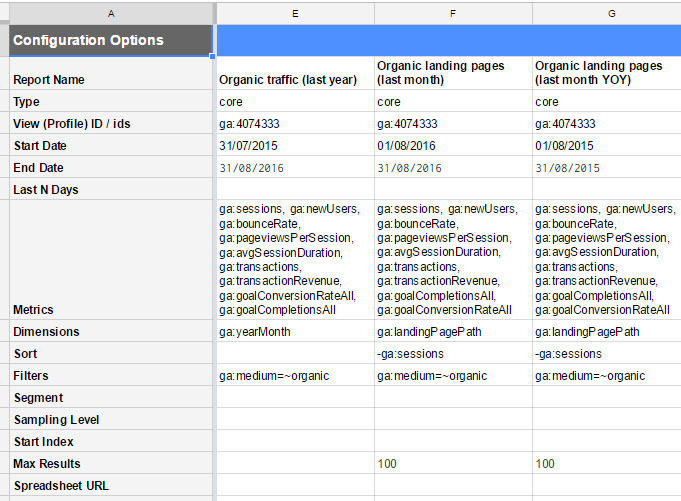 In this post, I explain how you too can automate the generation of custom Google Analytics reports within Google sheets to display key SEO, PPC, ecommerce, social media and email marketing metrics and projections for your clients or direct reports. Note that in order to use this add on you must have access to the Google Analytics profile that you wish to report on via the Google account you’re using with Google Sheets. Once you’ve downloaded the add-on and ensured you have access to the GA profile in question, you’re ready to start creating your first report. Here you will be able to specify which Analytics property and view you would like to report on and choose which metrics and dimensions to use for your report. This can be further customised after clicking create report, so don’t spend too much time customising your metrics and dimensions at this early stage. Once you’ve clicked ‘Create Report’, a new sheet will be created called Report Configuration, which is where you will be able to tweak the settings of each report you’d like to create. The report configuration sheet doesn’t have drop downs or help options for beginners, so I would strongly advise having the Analytics API reference guide open to identify which dimensions and metrics you need to use in this sheet when creating a new report. In addition to these fields, there are options available to sort the data, apply filters, use pre-defined segments from your GA account, specify sampling levels and limit the number of results returned in each report. 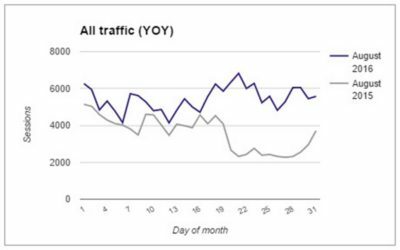 The report settings in column E are designed to pull together SEO metrics for our YOY reports, while the settings in columns F and G will provide us with data on the top landing pages for the last full month (column F) and the same month a year previous (column G). Now, because you will be automating the generation of these reports, it is important that your start and end date settings update automatically. To do this, we would need to enter formulas into the report configuration so they update automatically by using various DATE formulas. In the example displayed in column E above, we are looking to create a report that includes data for the last complete month vs. the same month a year previous (and each month in between). To capture all of this data, we need to ensure that the end date automatically updates to the last day of the last full month, and the start date is set 13 months prior to the end date column. You will note on the example report configuration screen that I have used a filter on all 3 reports to specify that I only want to report on traffic classed as organic. ‘ga:medium’ is the dimension, ‘=~’ is the operator for ‘matches’ and ‘organic’ is the only medium we want to report on. To add more than one filter to a report, you need to consider whether the filter should be an ‘and’ or an ‘or’. For help with the syntax for these fields, check out this guide for Filters with the API. The filters field allows you to drill down into specific dimensions and metrics. Each report you create will now be displayed on a new sheet, however these individual sheets can be hidden once you set up a dashboard to reference this data. This is simply raw data devoid of any formatting, so the next step is to create a ‘dashboard’ tab to better visualise this data. 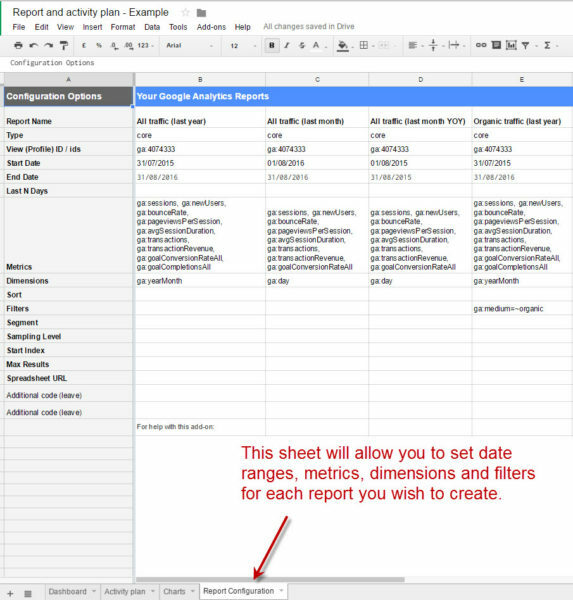 To create a basic dashboard to display data from multiple reports in Google sheets, you’ll first need to create a new sheet. On this sheet, you should create an empty table with row headings that correspond to the headings in your individual reports / sections of the reports you’d like to use on your dashboard. The ‘Year’ column in the table is simply created with the same formulas listed above, but replacing “MMMM” with “YYYY”. Once you have your date rows set up, you can simply use a cell reference to map the data over to your raw analytics reporting sheets over to your newly created table. Of course, creating a comparison table in your dashboard is just the beginning. You can move on from here to create and format multiple reports within your dashboard sheet and start adding charts and sparklines to visualise the data included in your dashboard tables. To create charts in Google sheets, I would recommend creating a new sheet (which can later be hidden) purely for the purpose of referencing the data you want to include in your charts. This will allow you to use attractive headings for your metrics rather than the standard ‘ga:sessions’ headings in the individual report sheets. Once you’ve created a set of reports and customised your dashboard, you can automate the generation of your reports using the Google Analytics add-on settings. This will ensure your reports are always up to date, and is particularly useful if you used formulas in your start/end dates within the report configuration sheet as we outlined earlier. 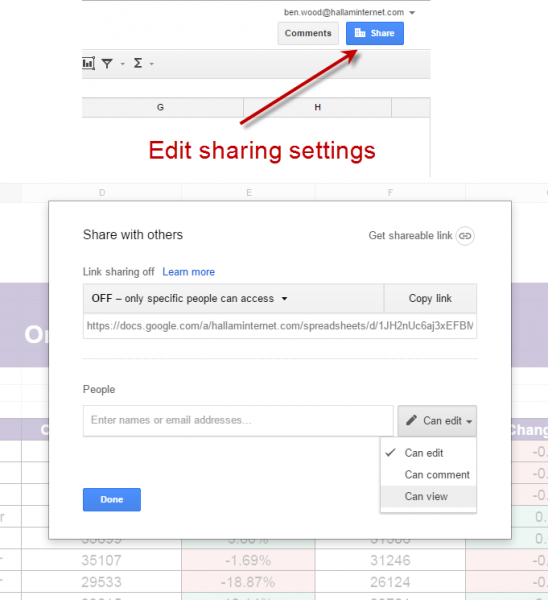 It is no secret that Google sheets is a great tool for collating data from multiple sources using APIs. Major keyword tracking providers such as Authority Labs and STAT provide access to their APIs, so there is no reason you can’t attempt to collate all relevant SEO data into a single Google sheet for your clients or bosses. In addition to collating all your SEO data, you could even pull social media data into Google sheets and display email marketing performance stats using the Mailchimp API. As a digital agency, we have delivered huge time savings by moving to this method for our monthly reporting, and at the same time have been able to provide each of our clients with customisable analytics dashboards which are accessible via a single Google sheets URL at all times. Working client-side, I often found that we had to tailor any reports delivered by an agency into an ‘internal’ format, so bonus points for any agencies who work closely enough with their clients to deliver a dashboard they’re happy to use to display all the digital marketing metrics they need to review. 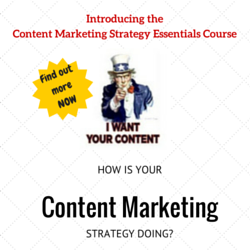 Of course, this reporting format is not solely for agency use. If you are an in-house marketer there’s no reason you can’t build a customised dashboard and share it with key stakeholders within your business who are interested in reviewing certain metrics within GA.
Ben Wood is the Marketing Services Director at UK based digital agency Hallam and has previously gained extensive client-side experience at a well known FTSE100 company. Ben specialises in SEO, PPC and Web Analytics. Great article and covers a lot of the elements I have (and do) struggle with, particularly filters! I love the Google Sheets API – you can do so much more with it, the two biggest limitation is your imagination and sampling, the second can be got around to some extent by SuperMetrics which is worth it if you have a lot of clients, it pulls in Webmaster Tools data as well…. One of the chart types allows you to pull in annotations as well so you can build up a report of Google updates & site changes you’ve made! You can also pull it through a Google Site – which allows you to create very cool and more dynamic ‘dashboards’ although typically google, these are not responsive and a tad clunky….